These have to be one of my all time favorite pants styles. I swear I had pants just like these when I was a girl, so when I saw the testing call, I had to do it! Also, they’re almost exactly like this inspiration piece I’ve had in my head for awhile now. If I can get my hands on some fabric like that…love the gold! 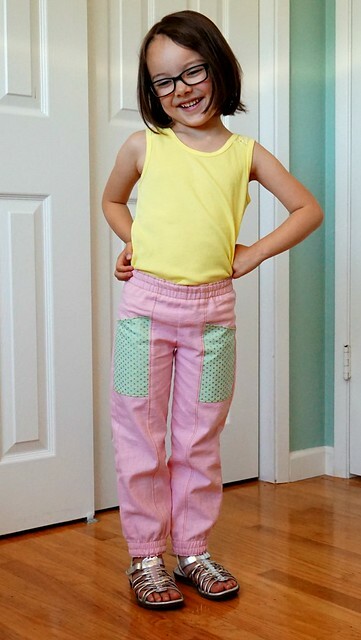 The Happy Pants pattern from Peach Patterns is a unisex harem pants pattern available in sizes 1-12 years, with two options, for woven fabrics. I tested both options for my girls. I made option B first for my older girl, and her measurements put her in a size 3 with 1″ added to the length. Finished inner and outer leg measurements are provided which makes it easy to figure out length, and if any changes need to be made. I made them in a very soft cotton linen fabric with mustard yellow top stitching. 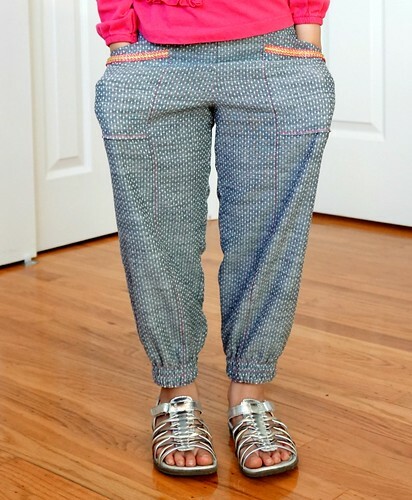 I love that the pattern instructions provide many tips on making the pants appear more like RTW pants. Topstitching was one of those tips. I also like the contrasting pockets with the gold polka dots. One can NEVER have too many Cotton + Steel polka dots! The waist is finished with elastic, and I chose the elastic hem finish for the ankles. I decided to do this with 1″ elastic (and an additional row of stitching in the middle) instead of two rows of 1/2″ elastic, but this is purely personal choice. As this was my first test version, the rise is somewhat short. This was changed in the final pattern, and you’ll see in my second pair of this option that the fit is much better. 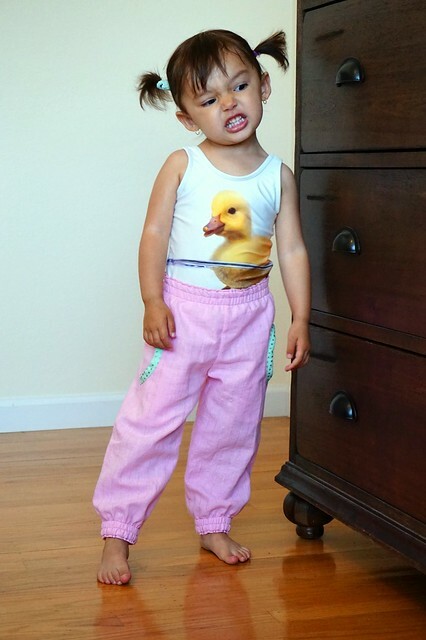 Even though we had this problem, they’re very cute pants, and she still wears them comfortably. 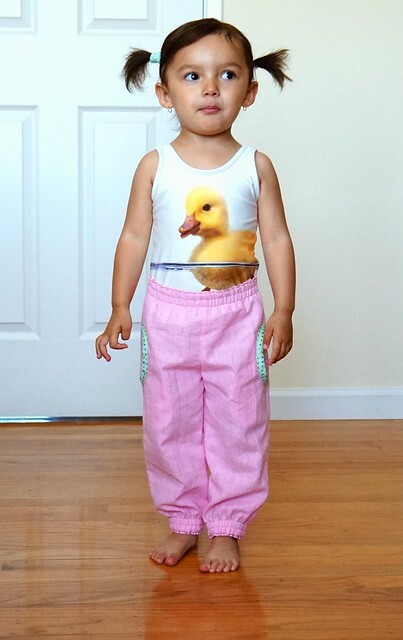 I also tested option A for my little one, and her measurements put her in size 1, shortening the length by 1″. 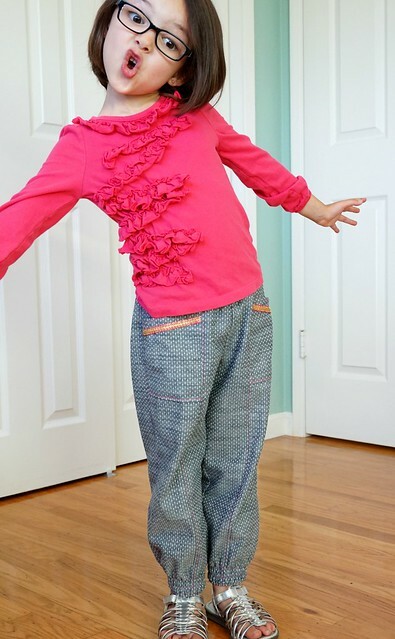 I made her test pants in a rayon challis from Girl Charlee. I was actually disappointed in this particular piece of fabric because it had marks all over it from being poorly printed. I probably wouldn’t have chosen this option myself, but after looking at some of the other testers’ pics of these pants in the larger sizes, I fell in love with them! 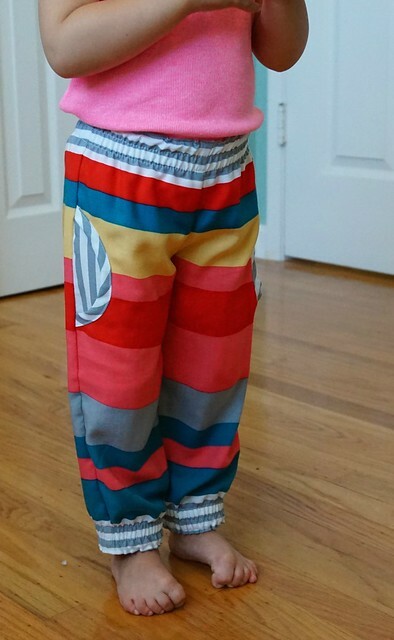 I love that the pocket can contrast with the pants, or the bias tape can contrast, so many options. These fit her very well, although they also had a short rise, and I felt the pockets were too low. You’ll also see that these issues are fixed in her next version as well. I chose the elastic hem finish for the ankles on this option as well. 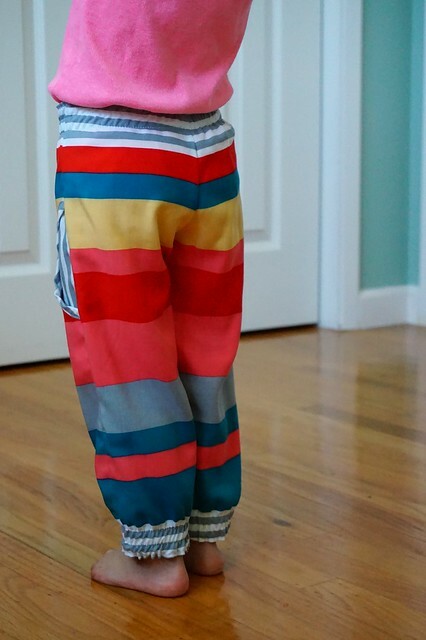 She looks so adorable running around in these pants, and the drape of the rayon challis is perfect for this pattern. She is so silly, every time I ask her to take pics, it’s a million of these poses. We end up laughing so much all of my pics end up blurry! 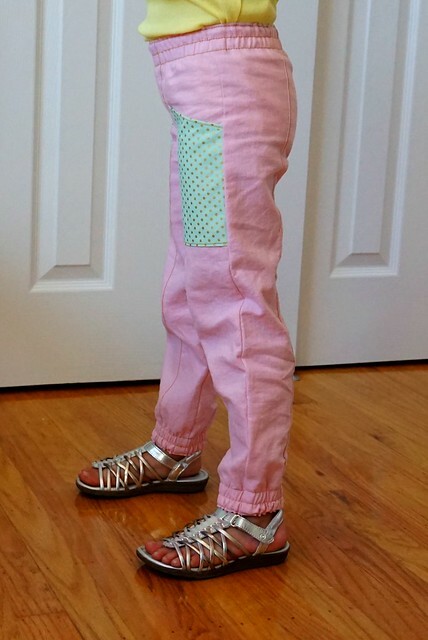 This was her favorite pair here, my second version of option B which was made using Kaufman Chambray Union Dots Indigo that I picked up from Imagine Gnats awhile back. I decided to go with a size 4 this time, and I made no changes to the pattern. I added some fun pocket detail using grosgrain ribbon and gold trim. Of course I used wonder tape to hold everything in place while it was sewn on. I just used contrasting pink thread to top stitch everything, so there’s a little pop, but not as much as top stitching thread would’ve given me. 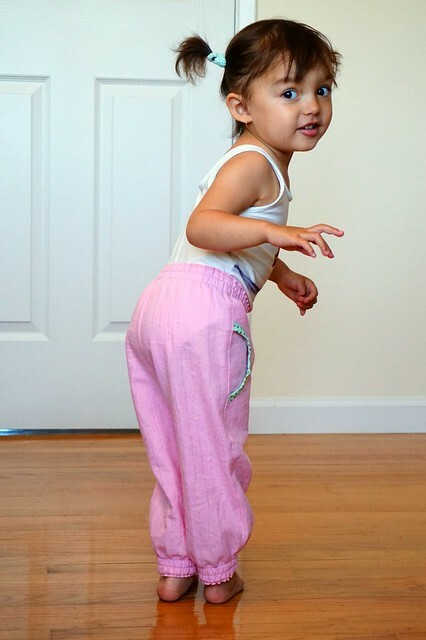 We absolutely love these pants, and the fit is perfect for her! She wore them to the beach and just loved how comfortable they were, plus she looked so adorable in them! The second version of option A I made in a pink linen that has little golden pin stripes. I made a size 1 with no changes to the pattern, and they fit perfectly (the pattern designer shortened the leg length of the pattern)! The pockets were also raised a little, and so cute with the contrast binding. Anyway, I really love these pants! I also love that they can be for boys and girls, something not super common in patterns. Many of the boys’ pants came out so awesome too! Such a sweet little monster! I promise you she is up to no good, or at the very least planning to be naughty! 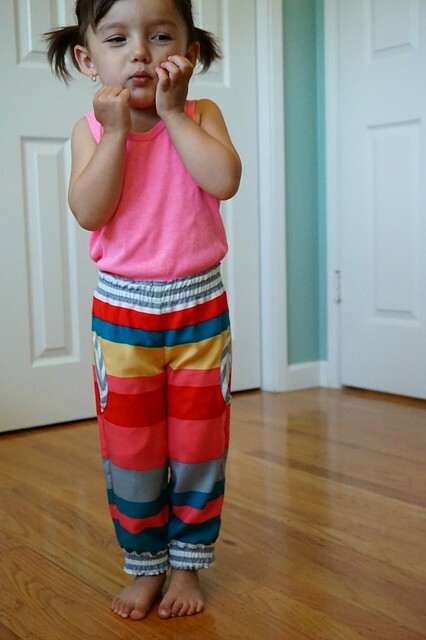 I highly recommend these pants for kids, not just because the pattern fit and instructions are so great, but because you can use so many different types of fabrics for these pants to achieve different looks year round. I love patterns that I can use over and over. The pattern is on sale for $5.95 through July, no code necessary. Don’t you wish these came in adult sizes?! I would be making myself sooooo many of these!